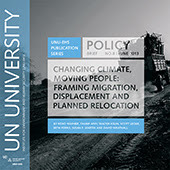 The UK Climate Change and Migration Coalition, which brings together groups separate concerned wwith environment issues and migrants’ rights groups, has published a new report featuring the voices of people forced to move for reasons which involve climate change. 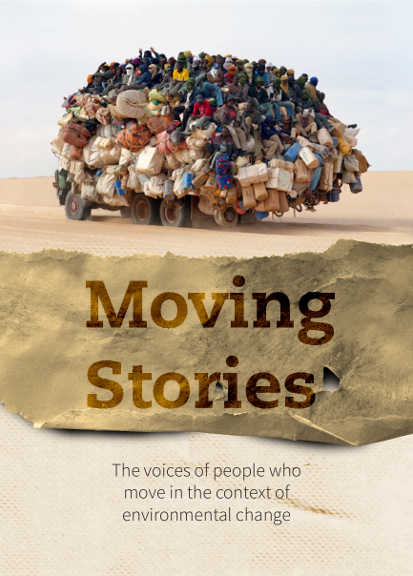 Moving Stories highlights these powerful, inspiring and often traumatic stories. Testimonies from ten regions across the world have been compiled from local news reports, academic journals and interviews recorded by civil society groups. The stories highlight different kinds of movement affected by slow– and rapid–onset disasters. The stories show us that movement linked to environmental change happens very differently in different parts of the world. The stories also reveal that individual decisions to move or stay vary widely even in response to the same disaster. The report argues that there is no “typical” migrant. It demonstrate the reality of migration and environmental change. A number of stories show how people have used moving seasonally and temporarily, rather than permanently, as a way of adapting to changing environmental conditions. Several stories demonstrate that remittances from other migrants have increased the resilience of people affected by disasters. Most importantly these testimonies give a human voice to this complex and controversial issue. The report concedes that we don’t have all the answers. But it hopes the Moving Stories project will help to ask better questions about how this issue is addressed. How can moving become an empowering way for some people to adapt to climate change? What is the role of remittances in building resilience to climate change? Will our existing legal frameworks for protecting the rights of people who move be up to the job in a generation’s time? Click on the links above to access the report. The Global Climate 2001-2010: A decade of climate extremes – Summary Report. Report from Wo rld Meteorological Organization. GENEVA 3 July 2013 – The world experienced unprecedented high-impact climate extremes during the 2001-2010 decade, which was the warmest since the start of modern measurements in 1850 and continued an extended period of pronounced global warming. More national temperature records were reported broken than in any previous decade, according to a new report by the World Meteorological Organization (WMO). (Source: ReliefWeb – The Global Climate 2001-2010: A decade of climate extremes – Summary Report). Family Migration and Access to Social and Economic Rights under the Legal Regimes of the EU and the Council of Europe. A new legal report by Nuala Mole from The AIRE Centre is now available as part of the IMPACIM project at COMPAS. The report, ‘Family Migration and Access to Social and Economic Rights under the Legal Regimes of the EU and the Council of Europe’, provides an overview of the case law of the European Court of Justice, the European Court of Human Rights and the European Committee of Social Rights on access to social rights – such as work, housing, health care, education and social welfare benefits – by foreigners resident in European states and in particular by their third country national family members. Collective Responsibility: The Perceptions, Expectations and Realities of NGO Coordination in Humanitarian Leadership. InterAction has released a new report entitled: “Collective Responsibility: The Perceptions, Expectations and Realities of NGO Coordination in Humanitarian Leadership”. The culmination of several months of qualitative research aimed at exploring the NGO role within humanitarian leadership, specifically Humanitarian Country Teams, the report highlights inconsistencies in understanding and attitude among HCT participants. All respondents agree that NGOs bring a specific value-added to discussions and decisions, yet this finding is contrasted by a perceived inequality of NGOs to other members of the HCT. – A project of the RRN’s Cluster on Environmental Displacement. – The Nansen Initiative’s first Pacific Regional Consultation. Follow link for text of Conclusion Document and see also related interview. – Series of three posts on climate displacement in Kiribati. – Series of articles on indigenous communities at risk in Alaska because of the effects of climate change. – See also related comment. – Series of interviews with physicians who volunteer with the Asylum Network. 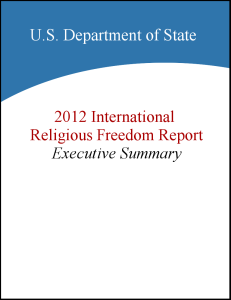 – “This comprehensive report comprises almost two hundred individual reports on countries and territories. Each report sets forth the laws, policies, and practices of governments; describes the nature of societal respect for religious freedom; and highlights the specific efforts that the U.S. government made in each country to promote respect for religious freedom.” More info. is available via humanrights.gov. – Other languages available via the Council’s web site; see also agenda for related meeting and ICMC press release. This article by the UKCCMC project manager originally ran in the Guardian on 17th of May. This week the Guardian has been running a major series on “climate refugees” about the village of Newtok in Alaska, which faces an imminent threat to its existence from erosion. The term “climate refugee” is problematic for a number of reasons. The first being that people who are facing movement do not like the term. The word “refugee” brings to mind a number of (not always accurate) images: tented camps, long lines of people walking, dangerous boat crossings. People facing the prospect moving hope that they will have some choice in the timing and circumstances of their movement and that when they arrive they will find work and become active members of their new communities. Their hope is that they will move with dignity. Apart from people’s own rejection of the “climate refugee” term there are also several other problems. It’s clear that there are connections between climate change and the movement of people, but the connections are not as clear as the “climate refugee” narrative suggests. The phrase conjures images of large numbers of people moving en masse over long distances and crossing international borders and possibly continents. It seems unlikely that climate change will produce this kind of human movement. Full article via Guardian comment piece: creating new narratives for migration and climate change | UK Climate Change & Migration Coalition. 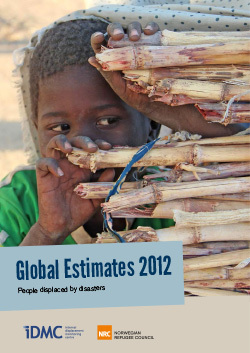 Global Estimates 2012: People Displaced by Disasters is a newly-released report from the Internal Displacement Monitoring Centre (IDMC). It finds that “98% of all displacement in 2012 [an estimated 32.4 million people] was related to climate- and weather-related events… .” Follow the link to access the text of the report, a press release, global estimates highlights, and a map. 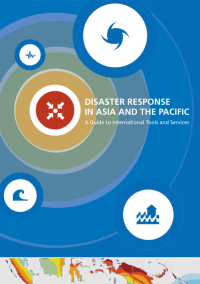 – Provides data for natural disasters in 2012. – A news bulletin from IOM. – Follow link for text of introduction. – See also related UpFront blog post.